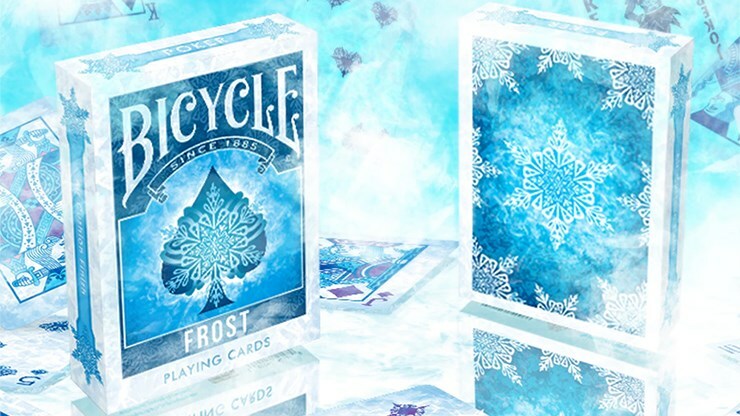 Grab yourself a cool and refreshing Bicycle Frost deck this summer. Produced by Collectable Playing Cards and Printed by USPCC this deck will turn your veins to ice at first glance. Be the first one to get your hands on one, but make sure to wear mittens. The back of the cards crackle with frost as the crystals form at the corners. The blue and white frost naturally forms a stunning snowflake pattern at its center. The Frost deck uses standard court cards dipped in chilly blue aura. There they sit, frozen in time, waiting for the frost to melt. The pips are quite unique as they resemble tiny snowflakes. Each snowflake pip calmly rests upon each card showing off their beautiful form for you to enjoy. The jokers, also frozen in time, are dressed for the occasion in blue, purple and white.